The holidays are upon us and while this time of year is filled with cheer and giving to others, as mothers, we can let the hype override our own needs. The last three months of the year have always been my favorite since I was a small child. It's something about the crisp air, the everlasting smell or cinnamon, and the cold nights warmed by a roaring fire that you'll never forget. That was back when I was a CHILD. Even though this time of year is still very enjoyable, it's really easy to leave myself off of the list. Personally, I get so excited about what I want to gift to my children and what theme I'm going to go with as far as decorations for the house, coordinating outfits, putting together a menu, and so forth- that I rarely think about self-care. Which is why I wanted to introduce to you my favorite night time regimen and the products I use that help soothe my mind, body, and soul after a chaotic day. I also wanted to make you aware of the importance of taking time out of your busy day to solely focus on yourself; especially with the holiday arousal right around the corner. According to Mental Health America, experts have found that good feelings can boost your ability to deal with stress, solve problems, think flexibly, an even fight disease. Taking care of your body emotionally, physically, and mentally through creating joy and satisfaction is an important part of living with or without a mental health condition. With that being said, we can't expect to be at our absolute best for everyone else when we're no good to ourselves. We all have pretty busy lives and we're always wondering when it will end, but it never does. That's okay. There are ways to help wind down from a stressful and/or productive day. At the end of the day, when my kids are finally in bed and my kitchen is spotless, I finally start focusing on ME. I actually get excited cleaning my kitchen because I save it as the last task on my to-do list. That way my brain knows once it's finished focused on cleaning, it's time to relax. Here are a few steps I incorporate into my night time routine to help ease my mind from a busy day. Wash my face. You may be thinking "Duh! Everyone should wash their face before bed." But what we use to wash our face is crucial. I like to use African Black Soap because of it's antibacterial properties that help treat acne breakouts and reduces discoloration and dark spots. A little goes a long way, so using a dime-sized amount will do the trick. 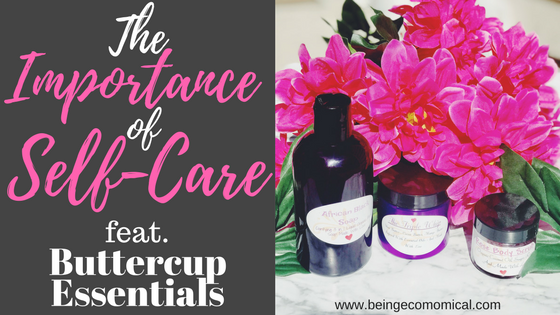 I recently discovered Buttercup Essentials Organic Body Care and I absolutely love these hand-made products! Everything on their site is literally made to order and I am currently incorporating their 3-In-1 African Black Soap into my skincare routine. Moisturize my face. I am currently using Buttercup Essential's Triple Whip formula to moisturize and hydrate my face once I've completed washing it. The best part about this Triple Whip formula is that it contains all natural ingredients such as shea butter, cocoa butter, coconut oil, and mango butter; which gives your skin all of the nutrients it needs to pull off a healthy and glowing look. Soak in the tub. After a long day, I love seeping into my bath water. I even like to play some soothing music in the background as if I'm relaxing at the spa. Seriously, life is what you make it! Exfoliate my skin. While in the tub, I incorporate an exfoliating regimen as well. I absolutely love Buttercup Essential's Exfoliant Rose Body Scrub- this scrub leaves your whole body feeling and smelling like a beautiful bouquet of roses! Moisturize my body. It's really important to moisturize your skin after bathing, especially in the cooler months. With less humidity, the moisture in your skin evaporates quickly. You don't want your skin to dry out and cause unnecessary itching, flaking and bumps. 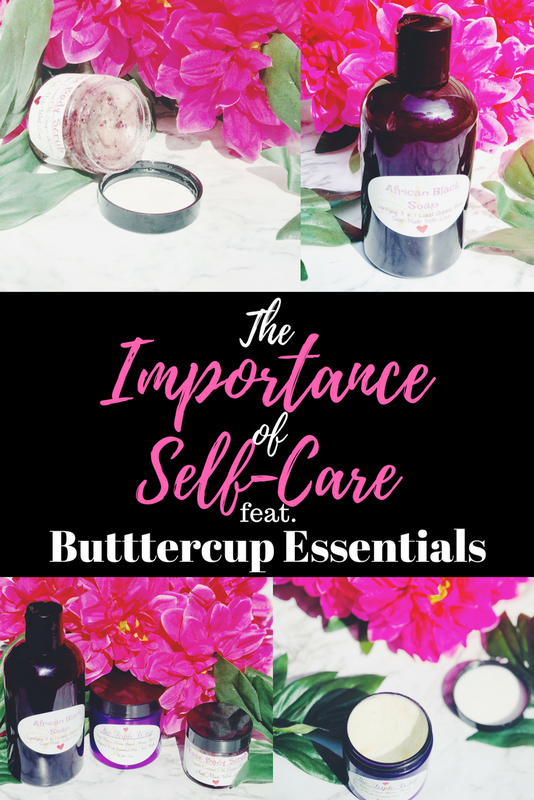 Again, I am loving the Buttercup Essentials Triple Whip formula for moisturizing my skin. I've even started to use the formula as a moisturizer for my hair as well. I can't begin to convince you of how relieved I feel after my night-time routine, until you try it for yourself! Allowing yourself time to wind-down, free of distractions, is very important! I also recommend putting away your cell phones and laptops during this time, to allow your brain to relax as well. That will prepare you for a better night's sleep. If you're like me and you love all natural skincare products, visit Buttercup Essentials and sign up to save 15% off your first order! Put yourself at the top of your Christmas list this year and invest in your self-care routine. These products are definitely made with love and will exceed your expectations! I also enjoy the fact that I can use their products on both my skin and my hair, which of course is 'being ecomomical,' and ultimately saving a few bucks to use elsewhere!